Home a-england	December 2014 Giveaway Featuring a-England and Morgan Taylor! December 2014 Giveaway Featuring a-England and Morgan Taylor! It’s Friday again, woot woot! Welcome to the third installment of my Friday giveaway for December! Back to the nails this time around with the a-England Elizabeth & Mary collection, which recently came out. One person will win all five of the shades as well as a Morgan Taylor Make It Last Top Coat! Please let the Rafflecopter widget load, and check the terms & conditions if you have any questions. I’ve been wanting to try this brand. I hear good things. I haven’t tried a-england–I think Virgin Queen is sooo beautiful. A-england is one of my favourite brands. My favourite color is Tristam. I’ve never tried them but all the shades seem gorgeous and I’d really like to. I never heard of this brand but I am loving those colors!!! i have a few a-england’s and really love them! of these, i’m most excited about virgin queen! I have one nail polish from A-England? it is Perceval. I love it, it’s the perfect red metallic. Virgin Queen and Queen of Scots are amazing! I have never tried a-England, but I love these shades! Especially the reddish-pink shade. I bet it is so pretty on nails. Haven’t tried it, they all look great!! I haven’t had the chance to try a-England yet, so I thank you for the opportunity! St. George has been on my lemming list for quite a while, but I have fallen in lacquer love with Crown of Thistles. I haven’t tried a-england polishes yet but im excited about Virgin Queen! I’ve never tried this brand but have been lusting over it online for a while! I’ve always wanted a-England polishes! They look gorgeous! I haven’t tried this brand before. I see the gorgeous holos and glitters they have and keep meaning to! Nope, I haven’t. The green one! I love A England! My favorite color is Morgan Le Fay, but I’m super excited for Queen Of Scots! I don’t try yet A-England polishes, but most fab of them – Tristam! No never heard of this brand. But I really like the purple or the green! I like the most She Walks in Beauty. It’s so pretty, especially in sunshine. I’ve never tried this brand of polish before! they’re all so sparkly and gorgeous! I admit I find them all rather swoonworthy. And I LOVE A-England polish! Tristam and Dragon are on repeat rotation in my world. They really know what they’re doing! Never tried one, But saint George and Perseval seem like shades I want to try. I’ve never tried the brand but these look really purdy! I love a-england! My favorite polish is Saint George but from this collection I’m most excited about Fotheringerhay Castle. Never tried the brand before! I’ve seen the blue swatched and fell in love! Amanda Fashion Footing´s last post…Top 14 from 2014! I’ve tired a England before and they are some of my favorite polishes. Although I haven’t purchased any since they stopped shipping to the US. 🙁 I’m looking forward to all of the new shades. I’ve never tried a-England polishes before, since they’re out of my budget, but I think the prettiest of them all is Saint George. I love the bottle design, it is so royal! I haven’t tried it yet, but virgin queen is gorgeous! Fotheringhay Castle is a colour I can get behind! I haven’t tried A-England yet as I usually don’t like holos, but theirs are always so lovely that I have quite a few on my want list. St. George is my favorite A-England shade! I have almost all of The Legends and a few Mythicals, as well as all from the literature collection (I can’t remember the name!). a england is one of my favorite brands. I think that the Elizabeth and Mary collection is gorgeous! I haven’t tried a-England yet, but I’d really like to try Crown of Thistles. I haven’t tried this brand yet, but I love the Crown of Thistles! Fotheringhay Castle is gorgeous too. I love a England. Their formula is butter! Of these, I love Virgin Queen. I haven’t tried a-England yet, but I am excited too! The colors all look gorgeous! I would love to try these! What a great giveaway! I’ve only tried Ophelia, but I want to try other colours. Liked the formula a lot. I love a england!! i’m exicúted about all of these colours, they are gorgerous! thank you for th giveaway! i love a england! i have fonteyn, fated prince and rosebower! i’m exited about all colours of this new collection! I haven’t tried this brand, but I’ve love to try the deep navy shade shown in your picture. I have been wanting to try A-England for SUCH a long time!! Thank you so, so much for the chance to win! I’ve never tried A England but I’ve wanted to since I discovered them a number of years ago. Queen of Scots looks beautiful! I looooooove a england polishes! I really am wanting Crown of Thistles and Fotheringhay Castle from this collection especially, but I love all of them. I love A-England. My favorite out of my stash is Tristam! I haven’t yet tried a-england but I want to so much!! They have some absolutely stunning shades, and I’m a huge fan of any company that does good holos! From this collection I’d love to get my hands on Crown of Thistles and Virgin Queen especially. Wow! Never tried a-england, but hear o lot of good about this polishes! Queen Of Scotts is my favorite ( even though I haven’t tried A-England yet!) I because I’m a NUT for blue polishes!! I used this brand already and actually liked it, throw these 5 I would like to try Virgine Queen and Gloriana. Good luck to me! Beautiful polishes, would love to finally try them out! Thank you for the giveaway! No, that would be my first a-england lacquers. But they are sooo sooo beautiful. I really like Queen of Scots. I haven’t tried this brand yet, but looking forward to ordering soon. Beautiful bold colors for the winter! I can’t wait to try some of them. No I haven’t, but that red looks gorgeous! Of course I have, A-England is my favourite indie brand ever <3 And not only because of its quality…A-England polishes do have a soul, they're not just colours. St. George is my absolute favorite color – so saturated and vibrant! In addition, a-England top coat is my Holy Grail! I have a number of a-England polishes… my fave is Jane Eyre– dark, vampy shimmery goodness! 🙂 Love this new collection– so many pretties! I’ve never heard of this brand. They’re all pretty colors but I’m always partial to a blue shade first. I’ve never tried a-England. I’m really curious about that green shade. I haven’t tried a-England yet, they are one of those brands that I always say I’ll try once I have extra spending cash. Not gonna lie, Queen of Scotts & Gloriana might be my spirit animals. Have never tried this brand, love all the names! Thanks for the draw! I don’t have any of their polishes unfortunately. I’ve always wanted to try A England nail polishes. I wish they were available at Ulta or Sephora so I could just pop by t eh store and get a couple. I’ve never tried A-England, but all their shades are stunning and I’d kill to get my hands on even one of them! excited to try that green!!! I most certainly have tried a-England!! It’s one of my top 5 indie polish brands – or really polish brands in general!! Adina’s polishes are sooooo gorgeous and well though-out, and the holo effect is like nothing I see elsewhere. Princess Tears and St. George are my fave shades but, really, she doesn’t make bad ones! lol. Thanks for this amazing giveaway!! Crown of Thistles is my dream polish. Perceval is the most beautiful red, I’ve seen so far. I’ve never tried a-England, but there are many shades I’d love to try! I haven’t tried these, but I’d love to. Fotheringhay looks delightful! I’ve never tried an a-england polish. I was recently given one though. I really love Crown of Thistles and Fotheringhay Castle from this collection. I haven’t tried a-england yet, but I always love looking at your swatches of their polishes. Thank you for the giveaway! All these colors are absolutely BEAUTIFUL! I’m fascinated by the reddish one in A England’s new collection. I have not tried A England, but all the swatches I see are gorgeous! I love A England! I’m most excited about the red one! I have some A England polishes : Holy Grail ( new version), Perceval and Avalon are my favorites…Gloriana catchs my eyes ! I love A England! My fav is Saint George!! My favorite A England is dragon and I can’t wait to try crown of thistles! I haven’t tried a-england but the red shade (Gloriana) looks amazing. I’d love to try Crown Of Thistles. I have a couple of polishes from Adina’s first collection but, the labels are off now. I appreciate that she’s creative and takes seriously her cruelty-free stance. Haven’t tried A-England yet but that blue one looks amazing! I’ve never used the brand before, but the red looks divine. I’ve never had the opportunity to try A England. All the colors look stunning. I can never get over how classy a-england packaging is! I would love to try this brand, so many pretty shades. I have not tried them but that blue looks gorgeous!!! I haven’t tried it yet, but I’m in love with the Sleeping Beauty collection because I’m a huge ballet fan. I love love love a-england. Consistent one coaters for me. Thank you for the giveaway!!! Love A-England. I just recently got my first ones when Llarowe had a sale. Ive been dying to try this brand! I LOVE a england! St. George is my favorite that I own. I was devastated when they could no longer ship directly to the US. I own Dragon and Saint George and both of those shades are stunning.. A England makes the most beaitiful shades! Never heard of this brand before! Would love to try it all! I own a few, and I love them. I really want to have Perceval and Avalon! I’ve been wanting to try a-England polishes for so long. They have some of the prettiest holographics! I love A England and haven’t bought any in quite a while. I have Sleeping Palace out to wear for my next manicure. Crown of Thistles looks soooo pretty! would love to try it! It is so weird that you are giving away this collection. I literally just watched the movie Elizabeth (better late than never) so I actually know what these names mean. Anyway, I have not had an opportunity to try a-england, but Crown of Thistles is calling my name! I love a-England!! Fotheringhay Castle looks gorgeous! OH my! Crown of Thistles looks so awesome! I haven’t tried any a-England before, but I have definitely been meaning to! I haven’t tried this brand yet but have loved the swatches of this collection. My favorite is Fotheringhay Castle. But Queen of Scots, Crown of Thistles and the Virgin Queen are gorgeous as well! I’ve never tried this brand before, but I’ve been wanting to. I’m excited about all of them! It’s a brand I SO want to try! Any of these would be a pleasure; I’ve heard brilliant things about the formula. And their finishes! Oh, yeah! I have never tried this brand but I wou love to! Especially the taupe-ish color to the left! Hi, is this giveaway open internationally ? Yes, I have a couple A-England polishes, and they’ve been lovely. I have a couple more in my “to be tried” drawer and can’t wait to get to them! Crown of Thistles has been on my want list ever since I saw it :). I’ve never tried this brand before, but I like the look of the orange polish! I haven’t tried a-England or any indie nail polish yet. I know that when I do, I am going to get spoiled lol. I am still entertained by drugstore polish, so I am trying to keep that going for as long as possible. Crown of Thistles and Fotheringhay Castle have been on my wish list for awhile. I love nail stamping and I can’t wait to do some burgundy or plum roses over Fotheringhay Castle. Love your blog! I have never tried these polishes but I have been wanting to. Thank you for another great giveaway, Kelly! I haven’t tried a-England yet, but I am excited about that dark blue polish! Whoa, just stopped in to get ideas about what to do on my tips for the holidays. Just in time for a giveaway! WooHoo. These colors look gorgeous and I would love to have some a-England. My favorite is Fotheringhay Castle! I love A-Egland i have dragon which is awesome for the holidays and Princess Sabra. The Elizabeth and Mary collection is super exciting, the history of the two amazing women makes it even better! That silvery grey loks amazing, and I love the green shades they do! I havn’t tried any of the A England polishes before but have been longing to for quite some time! From the swatches I’ve seen they are all Amazing. I’m hard pressed to pick a favorite but since I have a weak spot for purple I have to say Crown of Thistle. So pretty. I wish a-England was more easily accessible. Thanks, Kelly, for your great site and info!! I LOVE A-England, but I haven’t bought any since Royal Mail stopped allowing polish to be shipped out of the UK. I know I can pick them up at Llarowe, but I did really enjoy getting them straight from the source – Adina always has great sales and amazing CS! My fave of this group is Fotheringhay Castle (I love me some greens! ), but Gloriana is a close second (red + gold = Rachel squee!). I’m a huge Tudor history buff, so I need to get on this collection!! Rachel´s last post…Blog sale update! I haven’t tried it. but I’ve LOVED every swatch of Crown of Thorns I’ve seen! 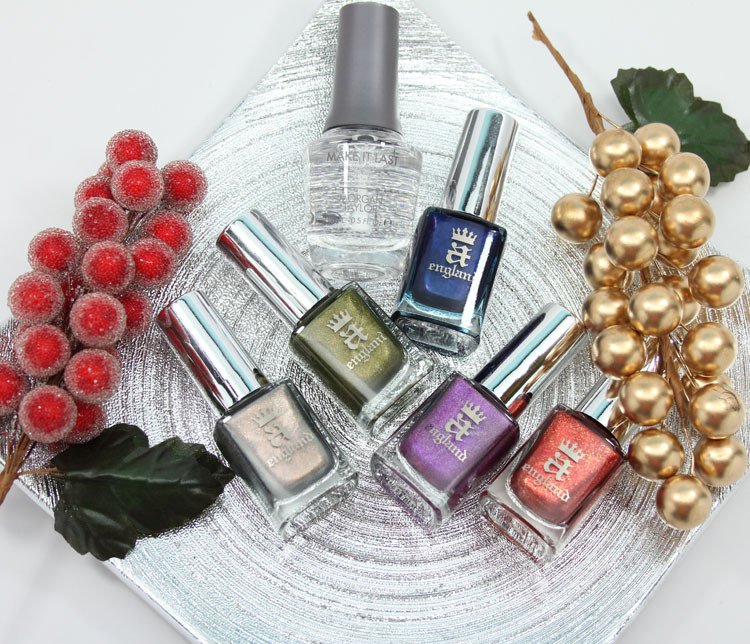 Painted Fingertips´s last post…HPB Presents: Christmas Nail Art! I don’t have any A England polishes in my collection and I’ve been dying to try one. These look so good! Want! I’ve never tried ’em, but that glitzy red looks perfect for the holidays! I’ve tried a few a-England shades, I’m really excited about Crown of Thistles! I love this brand so much! I have a few colors and they are my favorite, especially saint george! I’ve never had the chance to try the brand but would love to! I have one from them (lady of the lake) and love it! That chrome colored one looks gorgeous! I love this brand! Such beautiful colors! Super excited about Fotheringhay Castle! Never used A England, but I’d like to! I have been dying to try A-England. Queen of Scots just glows and Crown of Thistles is such a beautiful purple. I love A Englang and have quite a few but I didn’t buy the new collection yet…. The purple one is my favorite here. I haven’t tried A-England yet, but their holo graphics look lovely! I am rather curious about the gold shade that is pictured above. I have not tried the A England brand yet. I’ve never tried a-england yet. I’m most excited about the red and purple shades. a-England formulas are all super dreamy! St. George is still one of my favorites. I love A England but I haven’t tried any of their recent collections, so this would be awesome!! I love a-england polishes. My favorites are Saint George, Dragon, Avalon, and Briarwood. I have not had an opportunity to try a-england yet. But I love Crown of Thistles from this collection! I love AEngland! I have Sleeping Palace and Fated Prince and they’re two of my favorite polishes! Thanks for the amazing giveaway. I have a few polishes from A England and I really love them. Virgin Queen from this collection looks really beautiful. Love A England! I only have a few but Saint George is a fav. I am looking forward to trying Crown of Thistles! Thanks for this giveaway, I absolutely love A England. St. George and Dragon are my favorites. I haven’t tried A England yet but I’ve wanted to try them ever since I saw swatches of Fated Prince! I love them!! I am excited about the spice/orange color. I have a couple of A Englands. Gloriana looks amazing!! I haven’t tried this brand, but I’m so excited for all the shades! I love these colors! I really want to try Crown of Thistles. I would be happy with any of those colors!! No I have not heard of this brand.. would love to try it!! I have never tried this brand before it looks good! I don’t have any a-england yet, and I love this collection. When everyone was posting swatches of this left right and center, it was seriously weakening my low-buy resolve. I’m really in love with the green from this, Fotheringray Castle, was it? Superlove. Really, the whole collection is special. I’ve always wanted to try A-England, their holographic shades look amazing! I have not! But, I’d like to. Love A-Englands! The Saint George is my favorite one. Would be happy to test other shades. Sorry, rafflecpoter doesn’t show me any terms and conditions, so I don’t know if the giveaway is international. If not, please delete my entries. I’ve never tried the brand but all the colors look amazing! I haven’t tried this brand, but I’m so excited for Saint George! Never tried this brand, but the colors look lovely! Might have to look into these more! I haven’t tried a-England, but every time I see swatches I want to. The colors are all so rich! I’d especially love to try that blue. I have a few a-England polishes and I love them! My favorite is Saint George, but honestly I get excited about every new shade they release. I own and loveeee She Walks In Beauty and Princess Tears! I’d love to win this giveaway!!! I’ve got a few a-englands, Princess Tears is among my favorites. I’d love to win this collection! I’ve wanted to try this brand but can never bring myself to buy them. So beautiful!! While I’ve never used A-England I’ve been really interested in trying it. The purple color here looks fantastic! I’ve haven’t tried any but have always wanted to! Forgot which I liked best, I love that olive green! I have a few polishes from a-England and love them. My favorite of these is the green. I haven’t! But would love the opportunity! Most excited for that purple/lilac one! I have not yet tried this brand, but I love Virgin Queen. I adore their polishes but haven’t had the cash to purchase yet. Love them though! oh yeah, my fav shade is Virgin Queen. I’ve seen so many amazing shades from them on mail blogs but have never pulled the trigger! the blue, green, and red shades are my favorites! I love this brand! I’m most excited for Crown of Thistles. Thanks for the giveaway! A England polishes always have such a fantastic formula! I have yet to try this brand, so I am excited about all of their colors. I’m actually wearing AEngland Perceval right now! it’s currently the only one of theirs I own but I’m keen to try more. I don’t have any in particular I’m waiting for because they’re all gorgeous! Virgin Queen and Crown of Thistles! love a england. My fave boutique brand. this collection is so lovely! I haven’t tried any, but would be excited for these! Thanks for the chance!